Monday Morning Quote: "Travel is not a reward for working it's education for living"
Goooood morning readers! How are you? Monday is here: Head up and let's work! Monday Morning Quotes: A place where, each Monday, I'll bring my favourite quotes to send you a bit of my positivity to start the week on full power! Hope you enjoy it. Source: Anthony Michael Bourdain was an American celebrity chef, author, travel documentarian, and television personality who starred in programs focusing on the exploration of international culture, cuisine, and the human condition. 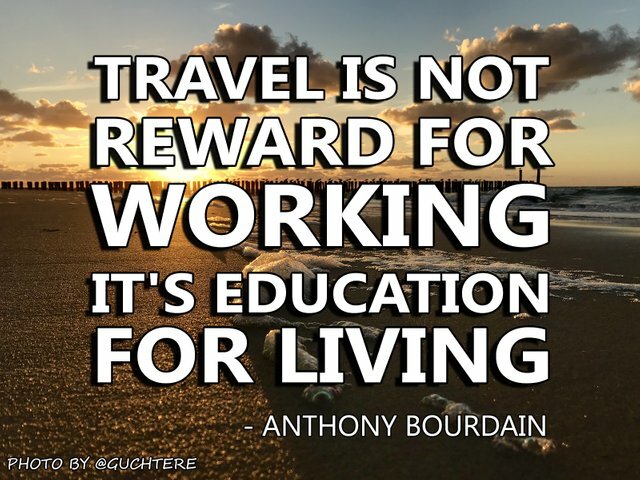 Do you work to travel or travelling is your work? When I first read this quote it immediately ressonated with why I've quit my work in the first place. I had in mind that working the whole year, just to spend 30 days travelling wasn't enough to fulfil my desire of visiting the whole world. I didn't want to have this 'reward' for a year of hard labour. What's your interpretation of this quote? Feel free to 'philosophize' on the comments down bellow. If you liked this post, please, consider leaving your upvote for a hot coffee. Disclaimer: The author of this post is a convict broke backpacker, who has travelled more than 10.000 km hitchhiking. Following him may cause severe problems of wanderlust and inquietud. You've been warned. I'm Arthur. 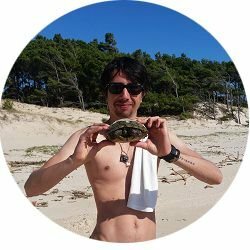 I blog about Adventure Stories, Brazil, Travel, Camping & Life Experiences. Follow me to stay tuned for more craziness and tips. [Blog #40] Steem Abstinence | Interaction | What have you done on your 'Steem Holidays'? Monday Morning Quote: "You must be the change you wish to see in the world. Thanks for the honor of using my picture @mrprofessor! I work so I can travel. But the travel itself is an education for life and the way I mean this is that I need it to keep my Dutch sobriety. With every journey I see many beautiful things, and it makes me thankfull for the things I have at home. Like I try to show with my adventures at my local area there are many beautiful things worth it traveling for, but don't forget your place at home. Many Dutchies can complain (and we are good at it!😜) about a boring flat country with all of the problems we see and it's weather of course. But I'm proud and I just love my country, don't want to miss it. So yeah, that's the thing! After a trip where we trully open ourselves to contemplate the small details, we come back home more open to discover the small nuances of our own place. It gets scary though when people spend the whole year complaining about their work and then they say "ah finlly I get to travel for 30 days" and then they go back to that same job they complain about. Yeah, things are a bit slow over here hahaha, but glad you came here! Your UA account score is currently 3.362 which ranks you at #7030 across all Steem accounts. In our last Algorithmic Curation Round, consisting of 369 contributions, your post is ranked at #147.